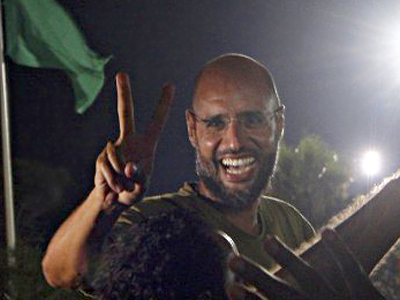 Saif al-Islam was once heralded as Libya’s knight in shining armor. Now the liberal-minded philanthropist and jet- set socialite has found himself in the unlikely position of carrying the flag of resistance for his slain father Muammar Gaddafi. 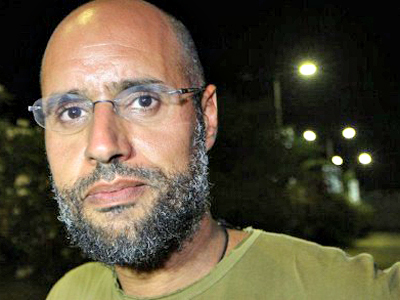 Saif al-Islam, the second son of the deceased former Libyan leader Muammar Gaddafi, was once a prominent public figure widely respected in the West for his democratic and humanitarian credentials. But as civil war tore through Libya and Saif found himself on the wrong side of it, he was soon rebranded as a psychotic, unhinged eccentric who plagiarized his PhD dissertation and allegedly kept tigers and falcons as pets. Saif, who initially had been reported killed on the same day as his father during the October 20 siege of Sirte, is now said to be living under the protection of Khalil Ibrahim, the leader of a Darfurian rebel group called the Justice and Equality Movement (JEM), Itar-Tass news agency reports. 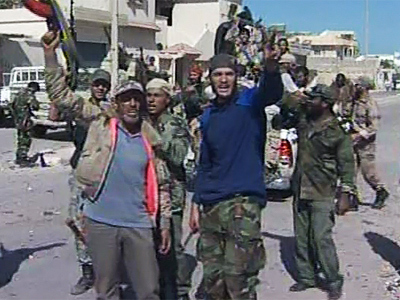 Ibrahim, who sought shelter in Libya from May 2010 to September 2011, was said to have fought on behalf of Muammar Gaddafi during the civil war. Earlier reports indicated that Saif had managed to flee Sirte on August 27 in an armored convoy that made its way to neighboring Chad, Itar-Tass reports, citing unidentified sources. However, Saif, in statements aired by Syria’s Arrai TV Channel on Sunday, claims to be leading the resistance from within Libya. “We continue our resistance. I am in Libya, I am alive, free and intend to go to the very end and exact revenge,” he said as cited by RIA Novosti news agency. As Saif has reportedly secured the support of tribes loyal to his father, the threat of inter-ethnic civil war looms over Libya as the political one is finally grinding to a halt. But long before the international criminal court (ICC) issued a warrant for his arrest for crimes against humanity on June 27, the West viewed Saif through very different eyes. 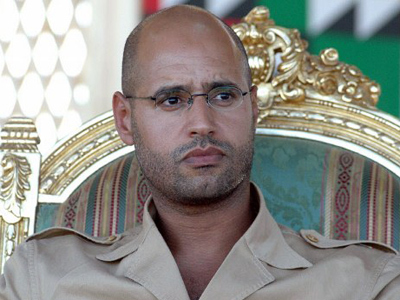 Saif al-Islam, whose name literally translates as the sword of Islam, had once been ironically described as the only one of Gaddafi’s eight sons not to have had his own militia. Fluent in English, German and French, Saif was also something of a patron of the arts. Apart from heading up multiple business interests, including an architectural firm in Tripoli, his charitable work and pro-democracy credentials ingratiated him among the Western political elite. David Held, a professor and political theorist at the LSE whose department benefited from a £1.5 million donation from Saif, once described him “as someone who looks to democracy, civil society and deep liberal values for the core of his inspiration," as cited by the Guardian. He was also known to have exerted a moderating influence on his father. Saif himself took credit for convincing his father to compensate the families of the 270 victims who were killed in the 1988 bombing of a Boeing 747 over Lockerbie, Scotland. 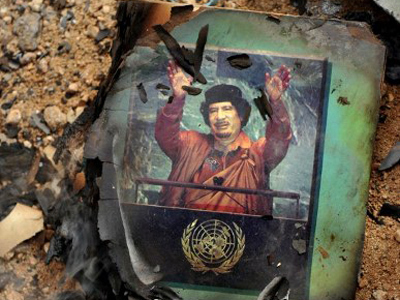 He is also said to have played a part in Muammar’s 2003 decision to halt plans to develop chemical and nuclear weapons. As the founder of the Gaddafi International Charity and Development Foundation (GICDF), he was instrumental in securing the release of six foreign medical workers who had been sentenced to death for allegedly infecting 400 children with HIV in 1998 at the El-Fatih Children's Hospital in Benghazi. His charity also helped mediate multiple hostage situations involving Islamic militants. His philanthropy took on an international dimension when Haiti was rocked by an earthquake in 2010, which claimed some 316,000 lives. In the wake of the tragedy, Saif organized the delivery of tons of aid to the devastated island nation. Apart from his humanitarian activities, he also claimed to stand for reform at home. In 2008, while speaking before thousands of young Libyans in the southern city of Sabha about life after his father, Saif proclaimed his country “is not a farm to inherit," as cited by the New York Times. 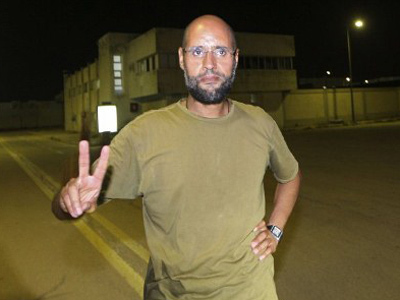 And according to a leaked diplomatic cable posted on Wikileaks, a US official said in February 2010 "young Libyans have repeated over the last few weeks that Saif al-Islam is the 'hope' of 'Libya al-Ghad' (Libya of tomorrow). "The official went on to say “Libya's swelling ranks of young adults…may welcome him as Libya's knight in shining armor," as cited by ABC news. 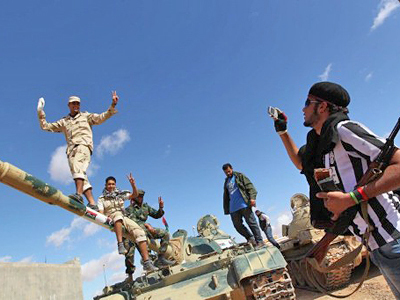 A year later, with his country teetering on the brink of a full-scale civil war, Saif proclaimed "Libya is at a crossroads. If we do not agree today on reforms, we will not be mourning 84 people, but thousands of deaths, and rivers of blood will run through Libya," he said, as cited by Al Arabiya news network. Saif’s warning proved prophetic. 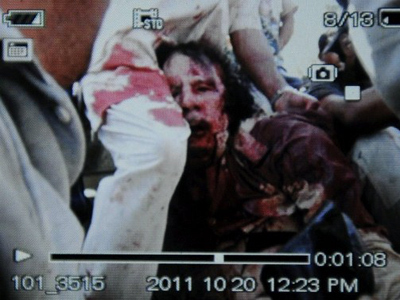 Whether he knew his father’s blood would also run through the streets of Libya is anyone’s guess. Equally unclear perhaps is how Libya’s next great liberal hope transformed into a counter-revolutionary fighter living under the aegis of an Islamist rebel army. Perhaps he has merely been driven by a desire to avenge his father and brother, who both died in mysterious circumstances after the fall of Sirte. It is also possible that he only played lip-service to democratic reform in Libya. Despite his pre-scripted comments, humanitarian acts and staged public disagreements with his father, he was in fact poised from the outset to succeed Colonel Gaddafi. In this context, Libya’s 2003 rapprochement with the West would be greater facilitated by a leader who said all the right things and, more importantly, gave Western corporations greater access to Libya’s vast resource wealth. Then, when revolution rather unexpectedly sparked last February, the Western powerbrokers may have calculated their interests would better be served under a new regime than a continuation of the previous one. In this context, Saif, who quite possibly sought legitimate internal reform, could have been radicalized by the NATO bombing campaign which was authorized under UN resolution 1973 on February 26. Apart from foreign intervention, he might also have been genuinely opposed to what he viewed as Islamist elements in the Libyan opposition, as he once proclaimed on CNN that “[We will] not let a bunch of terrorists control our country and our future," as cited by the Guardian. Whatever is driving Saif to continue the struggle, for now his future is as uncertain as the fate of his country which he has vowed to die in. Whether he soon meets the same fate as his father or lives to plunge Libya back into all-out civil war remains to be seen. But few could have imagined that the button-down cardigan intellectual who hobnobbed with the Western elite would one day fashion himself as Libya’s answer to Che Guevara.